Back in the day, nearly everything was made out of wood, from your cabin, to your teeth, to the coffin you typically found yourself in by 40, because you lived in a cabin and had wooden teeth. 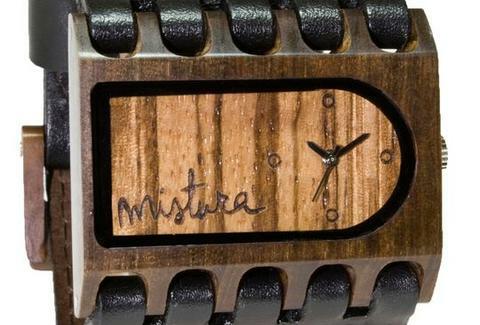 Now laying the wood to watches, Mistura. 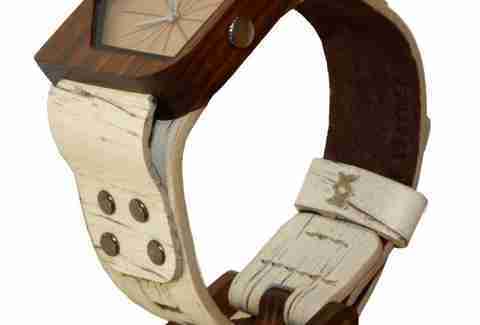 Based in Las Colinas, Mistura is a line of mostly unisex timepieces made 90% out of exotic woods, and put out by a trio of Colombian college pals, one of them a woodwork fanatic who abandoned his architecture career after discovering the shocking truth that buildings today are actually made of steel. The South American woods (purpleheart, ebony, teak, puy, guaimaro, nogal, plus African zebrawood -- sorry, bubinga) sit 6 months after harvesting to ensure moisture's gone, after which cases are carved, assembled, sanded, and polished using a combination of hands and lasers, then finally stuffed with Japanese-made Citizen movements; bands are crafted from Colombian leather exclusively sourced from fully consumed animals, so you can tell PETA types "but they made like 100 sandwiches from him!". Styles for '10 come in up to nine wood/color combos, and include the chunky, double tongue-clasp Ferro in teak case and nogal root face, the square-case/round-dial Ferrara in maple-like guaimaro/zebrawood or puy/bamboo with a white leather strap, and the square case/dialed Eclissi -- Italian for "eclipse", it's made with purpleheart wood, meaning you'll be wearing...a total eclipse of the purpleheart! Victory! Not that you'll want to throw yours away, but Misturas are obviously mostly biodegradable and renewable, a trait touted in two next-level prototypes: a canvas/leather-strapped model with the recycling symbol inlaid in its softly hexagonal case, and the Ferro PAP: Mistura's first non-wood case, made with a reclaimed plastic-aluminum-paper meld also used to build Colombian public housing projects -- so every time you look at it, you'll be thankful just to have your own cabin.